It is one thing to make sacrifices; it is quite another thing to become the victim of a kind of national amnesia. Reading Arthur’s diaries and looking at his photographs, I felt compelled to save his face, commit him to memory. 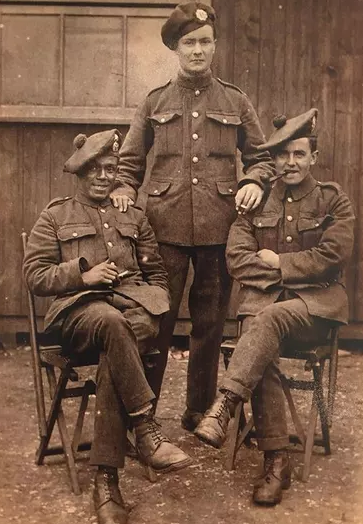 Arthur Roberts was a black Scottish soldier who survived the first world war and ended his days in an old people’s home in Glasgow. His name would have been lost to us were it not for a remarkable sequence of events. In the autumn of 2004 a young couple found his diaries, letters and photographs in a house they had bought in the city a few years earlier. The diaries were written over the course of a single year: 1917. In his diary, he detailed his experiences of war and loss, of heavy shelling, blood-covered rations, of comrades he witnessed dying. Arthur, who had died in 1982, was miraculously returned, his voice brought back to life. There were no black troops included in the Peace March of July 1919, a victory parade held in London to mark the end of the war. Allison O’Neill, one of the care workers in the home where Arthur spent the last of his days, said that he had felt forgotten on Remembrance Sundays. He would go and sit in his room and not watch the ceremonies on television. Perhaps he had tired of the “glory of war” and the “old lies”, and perhaps the wound cut deeper.